Mr Samuel Ofosu-Ampofo, the newly-elected National Chairman of the National Democratic Congress, said the party will on Sunday December 2, hold a national thanksgiving service at the Church of Pentecost, Teshie Nungua in Accra. He said the service was to thank God for successful national executives elections held on November 17, at the Accra International Trade Fair Centre. Mr Ofosu-Ampofo made the announcement in Accra together with his campaign team when he called on Apostle Eric Kwabena Nyamekye, the Chairman of the Church of Pentecost at the Church’s headquarters in Accra to thank the leadership of the Church for his victory and successful election. 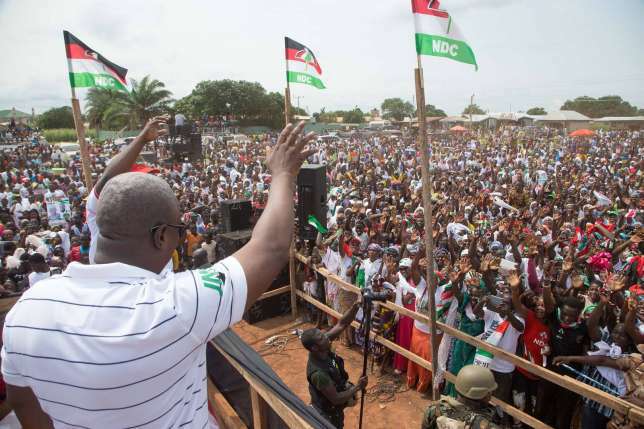 “Prior to the election, I visited the Chairman of the Church to seek divine direction and prayers and I am here to thank God and the leadership of the Church for winning the chairmanship position of NDC”, he said. Mr Ofosu-Ampofo, who is an elder of the Church, said he believed that the foundation of his campaign started with the Church and it was not a surprise that he won the election. “My campaign team used nine weeks to visit all the constituencies in the country, there were times we nearly had accident but God saved us. The campaign was a very tough battle but with God everything went on successfully”, he added. He said he had served in the country’s political dispensation for 25 years and thanked God for saving him from any untoward situations. He was of the view that, it was possible to combine Christianity and politics, adding that the Church had been a source of encouragement in his political life. “People think when you are into politics; you cannot be a committed Christian. I believe that Christians can also make a change through politics,” he said. Apostle Nyamekye encouraged Mr Ofosu-Ampofo to continue to hold on to God, saying “with God all things are possible”. He assured him of the Church’s prayers and urged him not to forget the will of God, because there cannot be success without the presence of God. Apostle Nyamekye, together with the Church members, prayed for him for a successful election and urged him to use his position to serve mankind.